The Philip Hobbs-trained Captain Chris, winner of Cheltenham’s Irish Independent Arkle Chase, justified 4/6 favouritism to take the Grade 1 Ryanair Novice Chase by a length and a quarter from Realt Dubh. 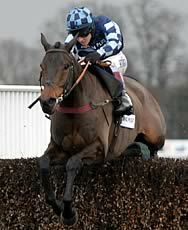 “The second horse is a very good horse and we are pleased to have won,” said Hobbs. “We’ve always felt that two miles is probably a bit short for him. I know he won the Arkle but they say you want a two and a half mile horse to win that race. We’re delighted, very pleased with his performance. I’m chuffed to bits. “He’s effective over two miles but ideally we’ll be looking for something over two and a half miles for his first run next year. I haven’t got anything obvious yet but maybe the Amlin Chase over two miles and three furlongs at Ascot in November might be a place to go, or maybe, although it’s a handicap, the Haldon Gold Cup (at Exeter) over two and quarter could be a possibility. “We would be half-thinking about the King George VI Chase but obviously that’s three miles and we don’t know yet if he stays that far but it’s an easy three miles at Kempton. “Richard (Johnson) is very adamant that good ground is what he needs - he doesn’t want it too soft. He is a very big horse so he wouldn’t want it too firm either. Good ground is perfect for him. Grahame Whateley, whose wife Diana owns Captain Chris, added: “We love coming to Ireland. It’s actually an Anglo-Irish win as Diana’s grandmother was from the west of Ireland. “He didn’t jump the greatest today. It’s the end of the season and he needs his summer grass - he will get it now. I’m really pleased. I think two miles is a minimum for him now, he really needs longer. Willie Mullins had earlier had his fifth winner of the 2011 Punchestown Festival when 14/1 chance Kerb Appeal took the Naas Court Hotel Handicap Hurdle.